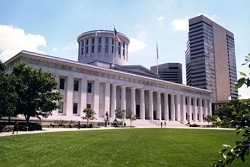 BioOhio holds its popular, members-only, legislative networking event each spring in the beautiful Ohio Statehouse. BioOhio invites Ohio lawmakers to join us and our members at the Statehouse for an opportunity to discuss the impact and importance of Ohio’s bioscience companies, research institutions, and educators. BioOhio takes this opportunity to recognize lawmakers that have shown particularly strong support of our industry, through introduction of bills, support of policies, and creation of initiatives that benefit growth of bioscience in Ohio. The event includes lunch, featuring brief remarks from special guest speakers, in the Statehouse Atrium. BioOhio coordinates individual meetings for members and their local legislators before and/or after lunch. BioOhio is grateful to our national partners AdvaMed, BIO, MDMA, and PhRMA for their support of Ohio’s bio industry. We are also grateful to member company G2G Consulting for their support of this event and BioOhio’s ongoing government relations work. Our industry has many faces – medical devices, research & development, lab equipment, pharmaceuticals, regenerative medicine, agricultural compounds, alternative fuels, lab testing services, wellness products, health & life science IT, and more. All of these sectors have a common goal, to improve the quality of life for our community, which is why our event has always brought support from lawmakers and government officials from across the political spectrum. Attendees have the opportunity to schedule meetings with your district’s legislators throughout the day. Visit the Advocacy section of our website to learn more about issues in the industry. We’ve also posted a number of helpful links there to identify your local representatives. Read personal perspectives from members that attended last year’s Statehouse Day here, as well as a summary of speakers and legislative awards here. To view past agendas, please visit the past events section.